According to the Beyblade Wiki, Shu was 11 years old at the beginning of the series (which is true, as stated in the Manga), but the Wiki also states that he's still 11, ONE YEAR LATER during Beyblade Burst God/Evolution, and 2 years later he's 13, which makes NO SENSE and the Wiki is completly ignoring the official timeline in this case. Alright, so here's my theory. Shu's official Birthday is September 23rd. At the beginning of Beyblade Burst (Spring 2017) he was 11 years old, according to the manga. During the end of the first season (Fall 2017) he probably turned 12. At the beginning of Beyblade Burst God (Spring 2018) when he became Red Eye, he was still 12 years old. 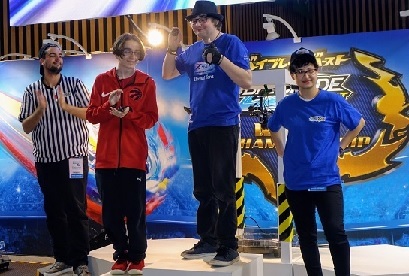 At the end of the World Championship (Fall 2018), he turned 13 years old. 2 years later in Beyblade Burst ChoZ he's 15 years old. PS: Please note that the years are only place holders and I've put them in there so that they line up with the real world events and WBBA tournament age regulations. Burst God/Evolution doesn’t take place a year later. That’s why nobody’s age changed between the two seasons. (Jan. 20, 2019 4:31 PM)TL14 Wrote: According to the Beyblade Wiki, Shu was 11 years old at the beginning of the series (which is true, as stated in the Manga), but the Wiki also states that he's still 11, ONE YEAR LATER during Beyblade Burst God/Evolution, and 2 years later he's 13, which makes NO SENSE and the Wiki is completly ignoring the official timeline in this case. Beyblade Burst God takes place in the same year as Beyblade Burst. With that logic, Valt, Rantaro, Daina, Kensuke, and most of the main characters are 15. No that means they are 11 in evolution and 13 in cho z (aside from characters like free who are surely older). So do you want a whole rant about how good Lui Shirasagi is? Im so confused because how does Lui relate to this thread about a character’s age? (Mar. 07, 2019 4:37 AM)Legend Red Eye Wrote: So do you want a whole rant about how good Lui Shirasagi is? (Mar. 07, 2019 4:43 AM)XSabxManiacX Wrote: Im so confused because how does Lui relate to this thread about a character’s age? Do I? wow than I apologize. I was actually intending to reenact Shu against Lui lmao. My opinion: Burst = 12 years, God = 13 Years, Cho-Z = 15 years. I mean, that’s only true for the dub who for some reason made the characters older than they are in the Japanese. In the Japanese Takao and co are actually around the same age as Valt and co when the series starts. Which, honestly, makes more sense to me regarding the characters and why they act a certain way. TL14 Shu is canonically 13 in ChoZ, just like Valt and Xhaka. (Mar. 13, 2019 9:27 PM)Mae Wrote: I mean, that’s only true for the dub who for some reason made the characters older than they are in the Japanese. In the Japanese Takao and co are actually around the same age as Valt and co when the series starts. Which, honestly, makes more sense to me regarding the characters and why they act a certain way. I’ve had a thought about this and I have two theories on why the Bakuten Shoot characters were made older in the dub. 1) An attempt to make the series accessible or more cool to more age groups which theoretically would mean more profit made. 2) They guessed by the animation of the first season where for the most part heights non withstanding most of the characters did look around their teens rather than the ages in the Japanese version. I also think they looked slightly older than the Japanese stated ages in G revolution as well your mileage may vary here. (Mar. 21, 2019 6:54 PM)TuckBlade Wrote: Sho is 15. First of all its Shu not Sho. Second, If Valt was in the same grade as Shu and they should be the same age. And Valt is 13 in Turbo/Cho-Z. That should mean Shu is 13 in Turbo/Cho-Z. I mean its common sense and Beyblade logic. Also, to add to the point that all the characters are older, remember Cooza Ackerman, owner of Alter Chronos. He taught Valt how to do a backflip. Now, imagine an 11 yr old doing that. Let's not forget that if valt and the rest of the characters were 11 then SURELY their parents wouldn't let their children go on their own to another country for a world tournament. And if Shu became Red Eye at 11 that would be pretty dark. In the first season, when everyone went to Wakiaya's summer house to train, they were using a barbeque. NEVER TRUST AN 11 YR OLD WITH FIRE!!! So, at the very least to do all of these things, they must be at least 13-14. Soooooo... to be honest, I think tuckblade is right. (Mar. 22, 2019 3:29 AM)boigamer25 Wrote: Also, to add to the point that all the characters are older, remember Cooza Ackerman, owner of Alter Chronos. He taught Valt how to do a backflip. Now, imagine an 11 yr old doing that. Let's not forget that if valt and the rest of the characters were 11 then SURELY their parents wouldn't let their children go on their own to another country for a world tournament. And if Shu became Red Eye at 11 that would be pretty dark. In the first season, when everyone went to Wakiaya's summer house to train, they were using a barbeque. NEVER TRUST AN 11 YR OLD WITH FIRE!!! Psshhh. Every Beyblade fan knows that Beyblade logic is way beyond reality. And plus Aiga/Aiger is 11 and his parents let him go. Why not the same thing for Valt's and Shu's parents. Hmmm??? the reality part I agree with. But still, even if they did go, what about their actions? Oh, yeah. Shu also lives in the U.S. in the first part of Cho Z. He moved back here. Also he has a smartphone. I don't know how the culture is in Japan and if they give their under teenaged children a smartphone but still. plus as you can see by my profile, Shu's hair is kind of long now, almost past his shoulders. I think their parent's would at least cut it a little. (Mar. 22, 2019 3:35 AM)Achilles25 Wrote: Psshhh. Every Beyblade fan knows that Beyblade logic is way beyond reality. And plus Aiga/Aiger is 11 and his parents let him go. Why not the same thing for Valt's and Shu's parents. Hmmm??? I can explain all that. The smartphone he has he probably got in NYC and plus he's probably rich from owning Raging Bulls. Th under aged thing wasn't a good reason because his parents either don't know or they just don't care because like I said he probably got the phone in the U.S. The hair is just big anime/beyblade logic and common sense I mean Wakiya's and Ken's hair was bigger than his in Season 1 not to mention Lui's, Free's, Phi's, Hearts', Ranjiro's, Joshua's, Zac's, Xhan's. I mean the list just keeps going on and on theres no doubt about it.